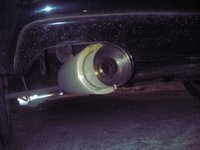 I've been told that a big exhaust outlet will decrease the power since it is a naturally aspirated engine. Not only power, but also throttle and low-end torque. This morning I installed a flange at the back of the exhaust to decrease the diameter of the outlet to around 2". I will benchmark my Mazda later on this week.